When you adopt a new kitten, there are quite a few decisions to be made. You'll need to decide on food, litter type, and a veterinarian. One decision that should be easy to make is whether or not to have your kitten declawed. Being able to scratch is a big part of being a cat. Our feline friends use scratching to mark their territory, relieve stress, remove the dull husks from their nails, and to stretch out and exercise their muscles. Declawing cats removes so much of what makes a cat a cat. Learn more in the article "Why Cats Scratch." The reason most people consider having the claws of their tiny new bundle of fur removed is to save their furniture and other belongings from damage. While this is understandable, it's important to know what you're agreeing to before you schedule a declaw surgery. Declawing is the amputation of all 10 (or 18 if you also have the back paws done) toes at the first joint. It is often done on small kittens, which increases the risks of anesthesia. Excessive bleeding is also a risk of the surgery. After a declaw surgery, there is a considerable amount of pain for the cat to endure. Again, 10 separate amputations are performed, and the kitten then has to walk on those surgical sites. This is a surgery that carries a fairly high risk of the occurrence of negative side effects such as opening of the incisions and infection. Cats also must use the litter box after a declaw surgery, exposing tender surgery sites to litter, urine, and feces. It is usually recommended that paper be substituted for other types of litter during the recovery period. Unfortunately, many cats don't naturally use paper as litter: it's not absorbent, and it doesn't feel the way cats expect litter to feel. Disrupting a young kitten's litter box habits can have disastrous effects long-term; it can cause them to begin to urinate inappropriately outside of the litter box, and it's possible for this to become a habit that continues even after the regular litter is replaced in the box. Personality changes in kittens can occur following declaw surgery. They can feel insecure without the protection that their claws provide them, and this can actually make them quicker to bite if they feel threatened. Cats walk on their toes, not the bottoms of their feet like humans do (they are digitigrade rather than plantigrade). Removing the tips of a kitten's toes leads to less ability to balance and more danger of becoming injured through falling. By now, you're probably thinking, "I don't want to have my kitten declawed, but I don't want my furniture ruined by her claws, either. How can I teach my kitten not to claw furniture from Day 1?" That's a great question! The answer is "Provide alternatives, train the kitten to use them, and use positive reinforcement." Appropriate height. Your kitten isn't very tall when she stretches up to her full height right now, but she's going to grow. 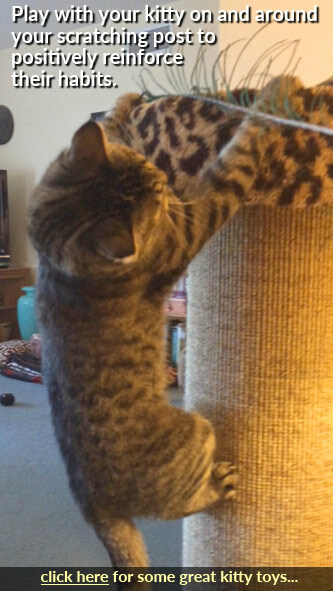 And she's still going to want to stretch up vertically to her full length against a scratching post. You must choose one that is tall enough to accommodate this activity. Maximum sturdiness. Your kitten also doesn't weigh very much right now, but when she's finished growing, she will need to be able to throw her weight into a cat scratching post without experiencing any wobbliness. If a post shows signs of toppling over, a cat won't use it. Cat-satisfying material. 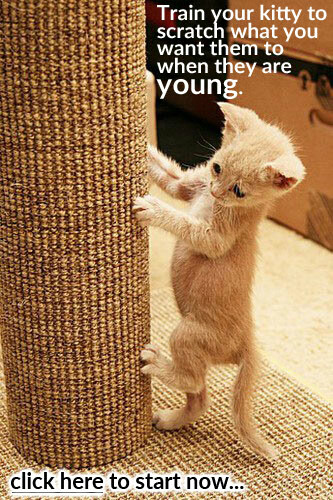 Many cat scratching posts are covered in carpet or soft materials. These are not ideal for scratching. Cats want rough surfaces to scratch, materials that mimic tree bark because trees are the most common scratching posts outdoors. The best materials for cat scratching besides bark are sisal material (not rope because it does not allow for a smooth scratching motion) and heavy-duty corrugated cardboard. When you first bring your new kitten home, you should have at least one scratching post already waiting there for her (and more than one is even better). Show her where her food and water, litter box, and scratching post are. You should also be prepared to bring your kitten home by having lots of toys ready. The best kitten toys mimic prey behavior, allowing your kitten to practice "hunting." Use a wand toy to get your kitten wound up, chasing the toy around, then drape it around or over the scratching post. She will probably pounce on the toy, landing on the post, and in this way, "accidentally" discover what a good scratching substrate it is. Toss a favorite ball or mouse toy toward the base of the post so your kitten chases it over, landing on the scratching post material. You can also leave toys around the base of the post when you're done, so your kitten will find them there and start playing again on her own. You may be able to put a favorite toy on top of the scratching post, but use caution with this because you don't want the kitten to fall from a tall post onto a hard surface. Use positive reinforcement only. 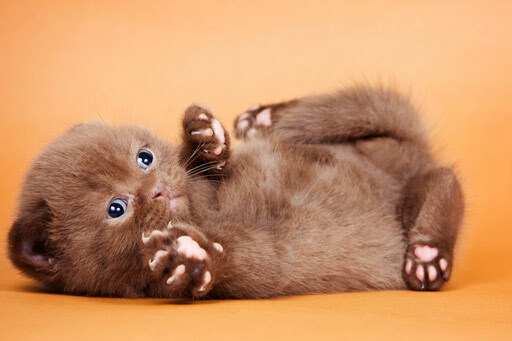 When your kitten scratches at the post, give her encouragement with praise, play, or a treat. If you see her scratching at your furniture, clap your hands loudly, say "No," and immediately do something to get her interested in going over to the scratching post. Praise her when she gets there and scratches at the post. If you choose great scratching products, use positive reinforcement, and show your kitten the proper scratching spots from the beginning, she isn't likely to ever scratching inappropriately, and you can avoid considering declaw surgery. You can learn more about training your cat to use a scratching post in the article "How to Train Your Cat or Kitten to Use a Scratching Post."